Asteroid Belt can be advanced and its rez cost is lowered by 3 for each advancement token on it. His belt of stone did shake and shatter. Some people say that this is really just a worse version of Fire Wall, and in many ways, they're not wrong. After all, after and 1, there's basically no difference between a Fire Wall and an Asteroid Belt save for the fact that Fire Wall can continue to grow in strength while Asteroid Belt cannot. However, it is important to note that a cheap barrier is sometimes better than a strong barrier, and Asteroid Belt can be very cheap if you're including advancement jank (e.g. Constellation Protocol, Satellite Grid, Trick of Light) in your deck. After just a single advancement and a Satellite Grid, Asteroid Belt will cost you just as much as a Wall of Static but with twice the strength. What's more, while Asteroid Belt will not lose its strength after you perform your advancement taichi, you cannot say the same about Fire Wall. In short, there's a place for both of these cards, and it would probably do you good to consider which card will serve you better. Asteroid Belt + Priority Construction +Trick of Light. 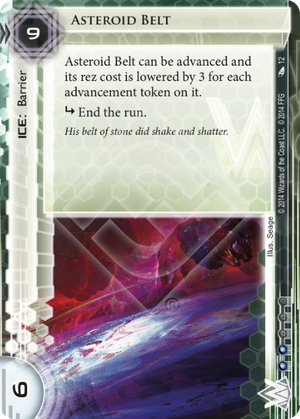 Playing an Asteroid belt using Priority Construction during the first turn or two of the game gives you a free-to-rez Strength 6 'End The Run' wall which is a show stopper for pretty much all runners aside Apex in the early game. Once rezzed, Trick Of Light them onto your other advance-able ice or agenda and worry not. Of course, it's a pain if you get de-rezzed, but the decks doing this are in a minority right now. I'm finding Asteroid Belt to be a real strong opener for fast advance and if you feel attached to Fire Wall, include both and Trick Of Light the tokens over once rezzed.